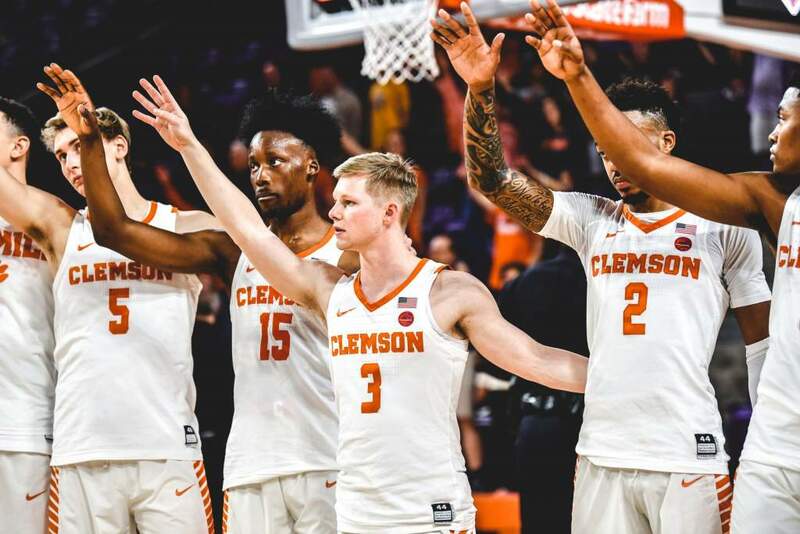 CLEMSON, SC – Devin Booker scored a career-high 22 points and Clemson held East Tennessee State to 26 points in the second half in a 65-58 victory over the Buccaneers on Sunday at Littlejohn Coliseum. The Tigers overcame a four-point halftime deficit and a nine-point disadvantage in the second half alone. It was Clemson’s second come-from-behind win in the last three games. Clemson improved to 8-6 with the win, while ETSU fell to 5-7 overall. Booker made 8-of-12 from the floor and six of his eight attempts at the free throw line for his 22-point total. His previous best was 16 points, which he accomplished four times. Booker added seven rebounds and four blocked shots in 38 minutes of play. Also in double figures Sunday for the Tigers was freshman T.J. Sapp, who earned his fourth start of the season. He responded in a positive manner, hitting 4-of-5 from behind the arc. He matched his season-best with 13 points. Andre Young hit two three-pointers in the second half, giving him 199 for his career, and finished the game with 12 points. He added eight rebounds, seven assists and a steal in a fine all-around effort. ETSU senior Adam Sollazzo surpassed his career-high in scoring with 27 points on 8-of-16 field goals and 9-of-12 free throws. He was supported by backcourt mate and fellow senior Tommy Hubbard, who totaled 19 points and eight rebounds in 36 minutes. The Tigers came out strong against the Bucs’ zone defense, hitting their first three three-point attempts for a 6-2 lead. After a Murry Bartow timeout, the lead changed hands multiple times even before the first media timeout. Sollazzo scored seven straight points to give ETSU an 11-10 lead, but Sapp swished his second straight long-range attempt on a Booker rebound to put Clemson ahead again. The lead changed hands 11 times in the first 10 minutes of the opening half, the last of which was a pair of free throws by Booker that put Clemson ahead by a score of 20-19. Clemson suffered a first-half drought that lasted over six minutes, as ETSU was able to take a 24-21 lead during the stretch. Smith broke the drought with a driving layup at the 4:54 mark. Clemson held the Bucs without a field goal for nearly four minutes, but Hubbard intercepted a Smith pass and took it the length of the floor for a three-point play to give ETSU a four-point lead at intermission. ETSU scored the first four points of the second frame, thus putting together a 7-0 run in a span of just three minutes. Clemson had two turnovers and missed five shots in the first three minutes of the second half, prompting a timeout from Brad Brownell after the Bucs’ lead was extended to nine. Milton Jennings sparked an 8-0 run that gave Clemson a 44-43 lead with 11:28 left after Young sank his 198th career three-pointer from the right wing. Jennings had a steal off Clemson’s fullcourt press and also had an inside feed to Booker, who nailed a left-handed banker. Sheldon Cooley put ETSU back ahead after a pair of baskets, the second of which was a spinning shot in the lane that rattled in for a 47-46 advantage. Sapp put Clemson up a pair with his fourth long ball of the game, and then Jennings followed with his third block of the game. 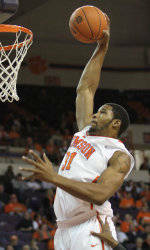 The Tigers then had a hit ahead on the break to Booker, who had an emphatic slam to push the lead to 51-47. After ETSU cut the lead to two, Tanner Smith jumped Sollazzo at midcourt and took a steal the distance for a gentle jam to make it 53-49 in favor of the Tigers with 3:26 remaining. Young gave the Tigers their biggest lead at 56-49 on a rainbow three-pointer on a Jennings assist. Young hit two free throws to make it an even bigger deficit for ETSU at 60-51. The Tigers open ACC play next weekend at home. Florida State will visit Clemson on Saturday, Jan. 7 in a 4:00 PM game televised by ESPN2.